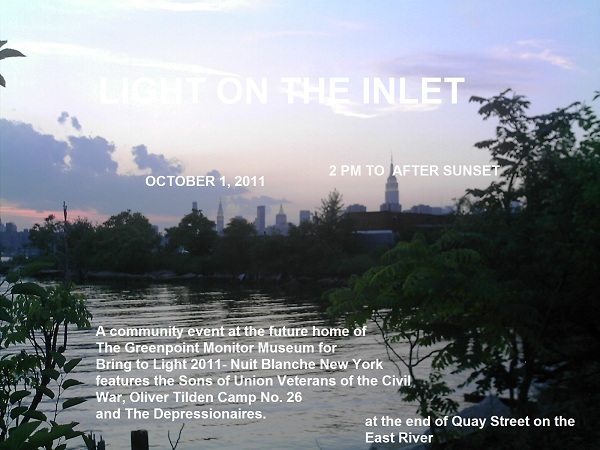 A community event at the site of the future home of The Greenpoint Monitor Museum, produced in conjunction with Bring to Light 2011 – Nuit Blanche New York, will feature The Greenpoint Monitor Museum, Sons of Union Veterans of the Civil War, Oliver Tilden Camp No. 26, and The Depressionaires. The public will have a rare opportunity to visit scenic Bushwick Inlet, a cove on the East River accessible at the end of Quay Street in Greenpoint, Brooklyn. The Greenpoint Monitor Museum will dedicate a sign to the 150th Anniversary of the Civil War and the Museum’s 15th Anniversary while identifying the place as the site of its future home honoring Greenpoint’s history. Funds for the sign were obtained through Assemblyman Joseph Lentol, and a donation from the Greenpoint Lions Club covered a sign support system and installation on land donated by Motiva Enterprises. The first of a series of USS Monitor and Civil War 150th anniversary events celebrating the “Laying of the Keel of the USS Monitor,” Light on the Inlet will feature Civil War tents, uniforms, artifacts, photos, video projection of archival materials, and live music by the Sons of Union Veterans of the Civil War, Oliver Tilden Camp No. 26 and The Depressionaires. At 4 PM and sunset (~ 6:39) – The Depressionaires perform polkas, waltzes, and popular songs from another time. October 1, 2011 starting at 2:00 p.m.